Although Frederick Frith, bootmaker of Petersburg (Peterborough) stated in the first issue of Frith's Bulletin that it was to be published every four weeks, only one issue of his newspaper is known to have been printed. 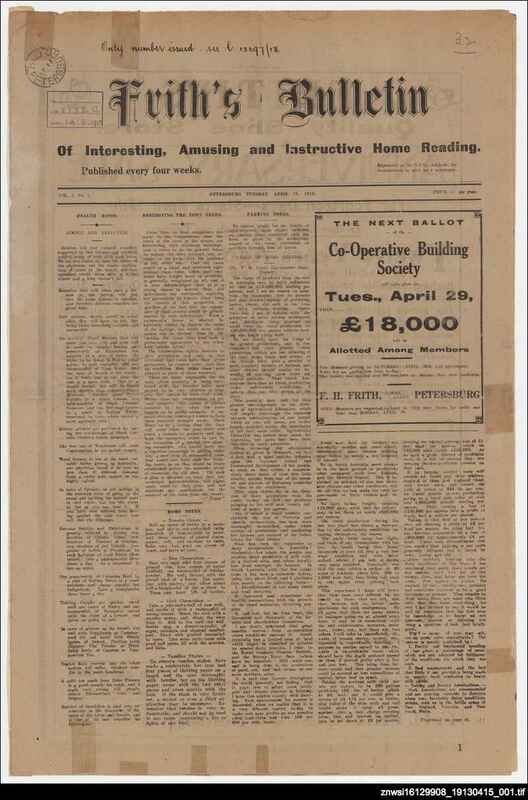 The newspaper consisted of eight pages, with a short story, school column, world news, health hints, an article about trees being cut down in the town, local council minutes and a page of sport. There were also several articles about agriculture by South Australian experts such as George Jeffrey, DF. Laurie and PH Suter. The sports page includes an advertisement for 'Frith's specially constructed football boots,' and elsewhere there is an advertisement for 'Frithoid,' 'a specially prepared waterproof sole leather now well known in South Australia.' The newspaper was printed by WH Bennett of the Petersburg Times.